Aries, July may well seem to be like a prison cell. However, there are possibilities how to make your stay in such a facility more pleasant. Fragrant soap or perfume is not prohibited at the beginning nor during the day. Major cleaning in your cupboard or drawer will also serve as "golden key" from such imaginary jail. Aries, just forget about all duties, at least for a while. Perhaps that the bars in your alleged prison are not made from solid iron at all, and you can be free much easier than you hoped. Rather than shout loudly, Taurus should whisper gently. The July 2018 Horoscope says that your wishes may be expressed silently and become reality; 100% better strategy for this month than yelling and asking for whatever you think belongs to you. At the same time, Taurus should realize that he / she walks along the slope of a high mountain. The way to the peak will still be exhausting and represents the second half of 2018. At the same time, just a few steps in the wrong direction and you can make a painful run down. But stay calm. According to the horoscope, Taurus are heading in the right direction in July. Gemini, do you like fresh fruit juice? In the coming month love and your emotional life will symbolize a very refreshing drink full of vitamins. You can read a romantic book under the duvet and dream endlessly. But, according to the horoscope, it will be significantly more effective to jump like a kangaroo around the world to find various forms of happiness. In July Gemini people will be equipped with the unique ability to tightly grip everything their hearts desire. Regardless of whether it is love, a new kitchen line, or a physical discovery that humanity is still waiting for. Cancer, the horoscope for July 2018 reminds you that it will be a month full of fun and relaxation for your zodiac sign. For example, your beloved notebook, which surely has the best possible care (undoubtedly being cleaned with an antistatic cloth once a week etc.) – in July may this piece of electronics serve as a shield against the attack of an angry dog. Well, Cancer should not forget to take life with humour. Do not take your work too seriously. You do not have to carry a notebook or laptop always with you. However, be appropriately armed or at least alert. And enjoy your life! July is the ideal month when people born in Leo can unveil a mystery that has been troublesome for a long time. Do you want to track your genealogical tree up to the Middle Ages? Are you wondering when the Chinese will land on the moon? Would you like to know where your love hid some secret savings? This hot month of 2018 will bring a desired answer to Leo. Virgo, surely you often argue with others whether you are concerned with your body and appearance only "a lot" or indeed "too much". But be yourself and ignore others. You count among the people born in a particularly sensitive and receptive zodiac sign, so taking care of the body is logically inevitable for you. The horoscope highlights that, unlike a car, no other body will be available during the whole lifetime. So it makes sense to care for the organism above everything else. If you would like to buy bouncy shoes that will save your joints, do not let yourself get dissuaded and get them in July. Likewise, a more expensive sunscreen or high quality toothpaste. Libra, moderation is a feature that best suits your zodiac sign. Nobody knows why, but in 2018, the fate seems to change this natural and given fact. That is why in July you will have a great appetite for "drinking the bottle all at once" rather than just for "a couple of sips" – being unrestrained in any form can make you feel terrible. In other words, Libra should pay particular attention to patience and balance in July; in love, in feelings and of course in dealing with money as well. Scorpio, please, no excuses! The constellation of celestial bodies in July definitely does not favour the lazy ones; and that is true for Scorpio above all. Only the places you see with your own eyes will remain in your memory and they will also help to make your life better. No matter whether you are longing for visiting Las Vegas, Hong Kong, Calcutta or a small hike that is only 10 miles away from your home. July 2018 is the month when YouTube or National Geographic documents simply cannot offset any personal travel experiences. The horoscope says, Scorpio fly, sail, drive ... and enjoy new wisdom you will meet on your trip. People born in the Sagittarius zodiac sign may choose from two very different scenarios in July. Do you want to be a diligent bee or rather to remind an ordinary sponge (the good old bathroom assistant)? The horoscope shows a clear choice between these two extremes to Sagittarius. It is up to you how you imagine your future in July and, above all, how you arrange it yourself. It seems that even in love you will need to be the more active element in the pair. But sweet will be a reward, the outline of which you will draw yourself. The zodiac sign in which you were born does remind the mountain animal. And surely not by accident. Capricorn, in July you will understand why. Capricorn will often be tense, impatient and hot headed. The one who will boil Capricorn's blood should, according to the horoscope, expect consequences of provoking a truly wild animal. May Capricorn feel annoyed enough? Than count with the worst – just a pile of ash may remain from your friendship, or maybe from your house as well. And apology? Don't be waiting for any. 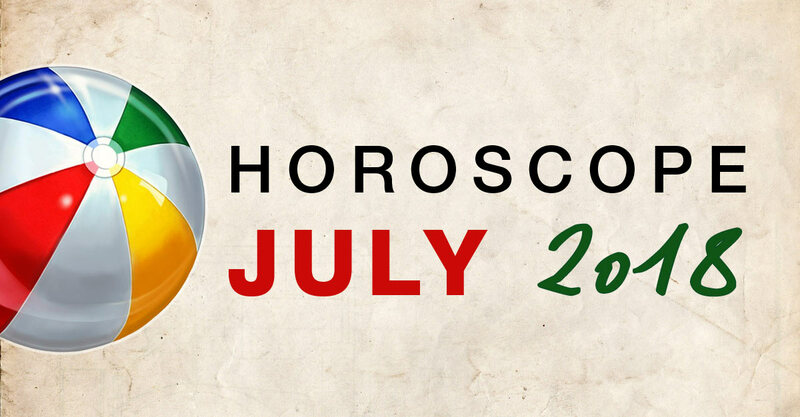 July 2018 will be very "hot" in many ways and that will be obvious also in Capricorn's passion and love. Aquarius should rely primarily on smile in July. It is available for free and effect is guaranteed. A happy number will be five. Are you asking why? The one who stands in the first row at a rock concert will usually be deaf or squeezed; who is the first in the queue, gets lunch too hot (the "golden" fifth, often gets the best). Being the fifth also means to be part of a wider team. The horoscope really don't encourages Aquarius to sound like a stand-alone note, but rather to become part of a beautiful chord in the whole song. July 2018 will attract Pisces to go with the crowd. It's just as simple as going down the river. July, however, is suitable for you to wake up, stop and walk in a different direction; looking after your own "true destiny". It also applies to emotions and love life. The horoscope for July predicts courage to Pisces. You will be able to recognize the wild-field scarecrow from a real demon. Pisces, open your eyes and try to see all the subtle relations that have escaped you so far.